For my birthday last week, I got a sweet cook book from my close friends R and N: “Essentials of French Cooking” that is divided by the regions of France, and has an incredible selection of recipes, with classics like Coq au Vin, Beef Bourguignon and Tart Tatin, as well as less known dishes like Blue Cheese and Walnut soufflé and Sausage and Choucroute (sauerkraut). Everything in this book looks amazing and everything calls for a lot of butter!! Today I finally decided to stop drooling over the pictures and cook a recipe from it. Looking at the selection of available produce in my kitchen, I decided to use the potatoes, I bought a hand-full of blue potatoes about a week ago and a fresh load of Yukons yesterday, and it was time to make something out of them. 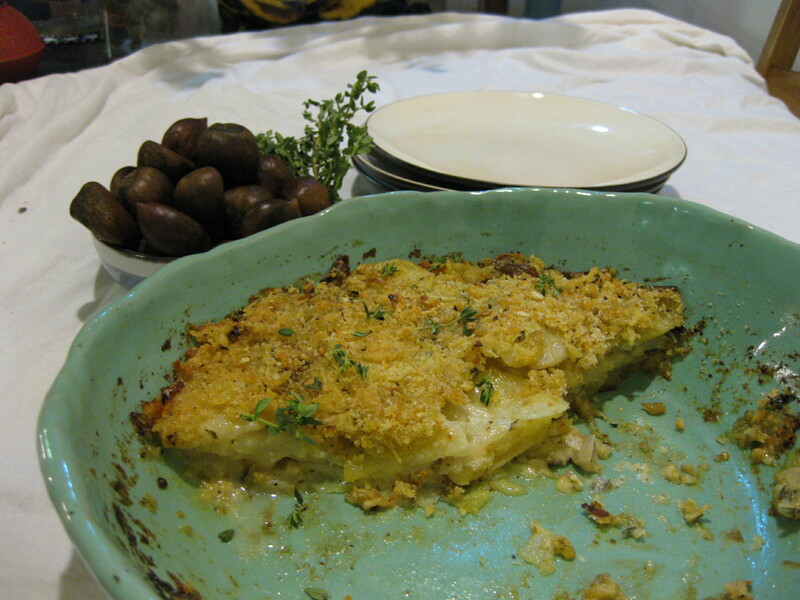 Pommes Anna- Anna’s potatoes, is a potato gratin named after Anna Deslions by the Cafe des Anglais in Paris, it is tasty and easy and looks beautiful. peel the potatoes, rinse and dry. Using the thin slicing blade on a mandolin or a sharp knife cut the potatoes into slices 1/8 ” (3mm) thick. in a sauce pan melt the remaining 4 tablespoons of butter until in foams and set aside. arrange some of the potatoes in a single layer in the prepared pan, overlapping them just slightly. lightly sprinkle with salt and pepper and drizzle with the melted butter. Repeat the layering process with the rest of the potatoes. bake in the oven until the potatoes are tender when pierced with a fork and the top is crisp and golden, 45-60 minutes, transfer to a wire rack and let stand for 5 minutes. run a knife around the edge of the pan, then place a plate over the top and invert the pan and plate together to unmold. Since I didn’t use 1 1/2 lb of potatoes they didn’t go all the way to the top of the pan, which made it very hard to invert and unmold, I did, however, use a cake pan that opens with a spring, and simply opened it up and transfer the whole thing to a serving dish. When it comes to grocery shopping I do 99.9% of it at the Park Slope Food Co-op, I say 99.9% because every once in a while I’ll get lazy and buy some pasta or chicken at the neighborhood’s Italian market. The co-op’s selection of fresh produce is so great that often I buy things without having a plan as for what to do with them. 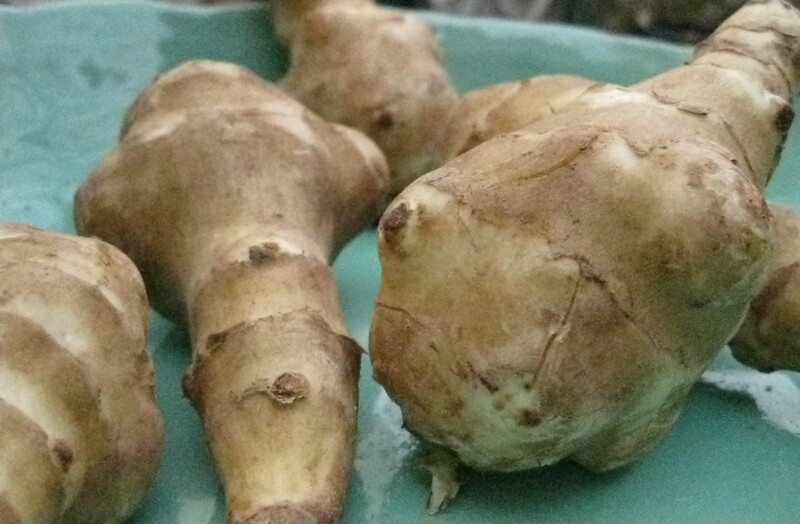 That was the case with the Jerusalem Artichokes I pulled out of my fridge today, I bought them last Saturday simply because they looked so fresh and beautiful and because I love Jerusalem artichokes (or Sun chokes as some call them). 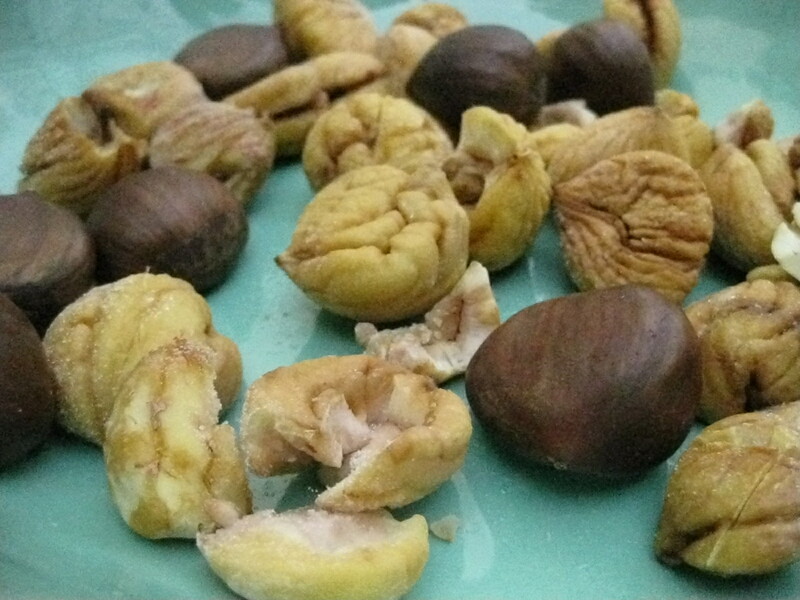 I looked at the artichokes and then around my kitchen, I spotted some Chestnuts and tried to figure out how to pair the two, a short online search yielded a few recipes but non involved Chestnuts, and then I found it, thank you Martha Stewart. In a large saucepan, combine Jerusalem artichokes and milk. Bring to a boil, reduce to a simmer, and cook for 10 minutes. Drain, reserving 3/4 cups of the milk. Preheat oven to 450 degrees. In a medium bowl, whisk creme fraiche, reserved milk, lemon juice, 1/4 cup Gruyere, thyme, salt, chili and pepper. Add artichokes, potatoes, chestnuts, shallots; gently mix to combine. Transfer to a 6-cup shallow baking dish, and cover tightly with parchment-lined aluminum foil. 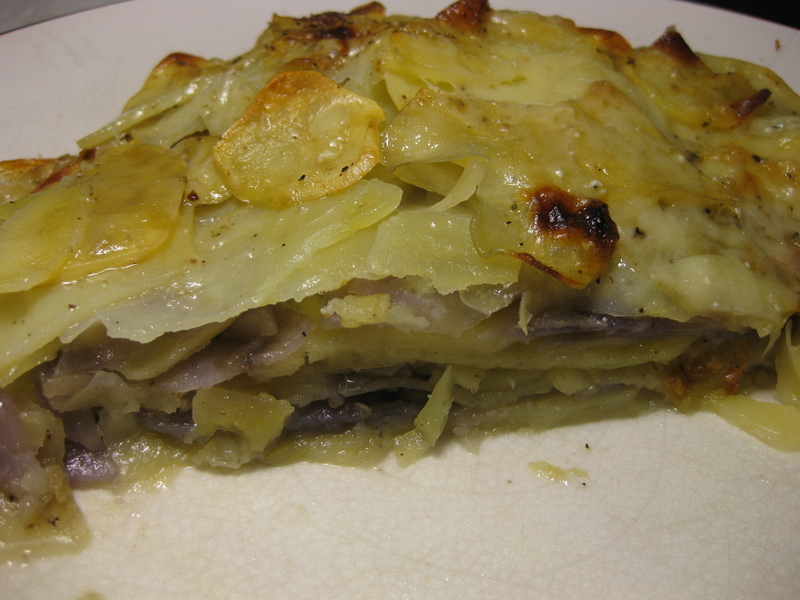 Place on a rimmed baking sheet, and bake until artichokes are tender, about 1 hour. Remove foil, and sprinkle with breadcrumbs and remaining 3/4 cup cheese. Bake, uncovered, until golden brown, 8 to 10 minutes. Serve warm.